See Post play - Ganon Baker big fella moves. Two balls, alternating dribble to the first and second cones, step-slide and pound dribble to the chair, put one ball on the chair (here with the left hand), make a post move (e.g. one-dribble middle jump hook), get the second ball from the chair and make a counter-move (e.g. up and under). Putback any miss. See Dribbling - Ganon Baker four-square, Post play - Ganon Baker lane dribbling. Dribble two balls, pass one ball to coach (or partner) off the dribble, coach puts it in a chair, pass the second ball, cut to pick up the ball on the chair (e.g. 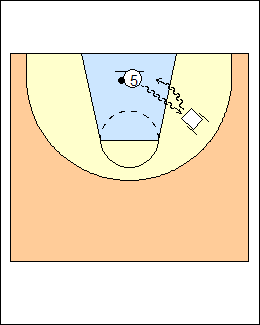 v-cut), make a post move (drop step, hook shot, step-thru), coach puts the second ball on the chair, pick it up and make another move, dribble both balls to the start and repeat (to keep the first ball from rolling away, coach rebounds and puts it on the chair). 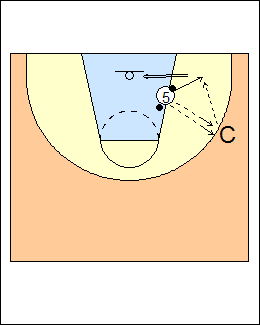 See Post play - Pitt post series, Florida off the block, V-cut shooting. Put a ball on a chair, cut from weakside, a defender gives contact, pick up the ball, make a post move, put the ball back, go again. See Post play - Pitt 1 on 1 live. 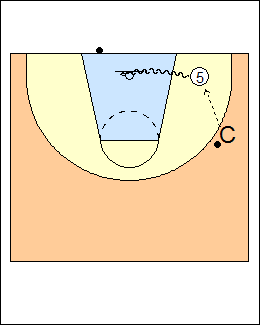 One ball, dribble out to a chair, bang the chair with the ball, make a mid-post move, e.g. catch, square up, rip high or sweep low. 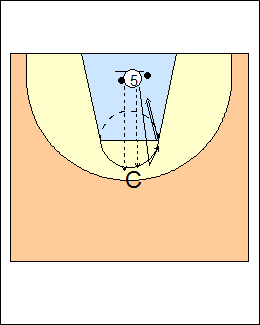 See Shooting - Chair drills. 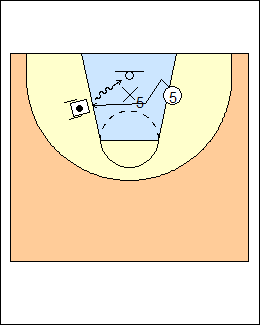 Rebound, spin a pass out to the other wing, follow when the ball hits the floor, make a mid-post move, continue. Two balls, pass both balls off the dribble to coach (or partner) out top and follow, coach holds them out on each side, go to either side, get a ball, drop step on the inside foot, Paul Pierce series (e.g. square up and shoot), repeat on the other side, starting from in the lane. 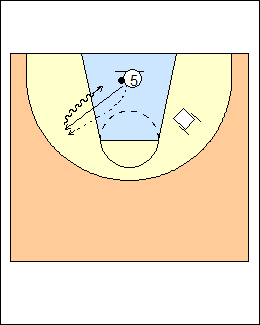 Variation - spin a pass out top, go when it bounces. See Post play - Sweep from flash, Pete Newell post moves, Shooting - Procopio game shots, Eastman quick square-ups, Procopio wing. Two balls, pass off the dribble to the wing, pop to the short corner for a pass and shot. 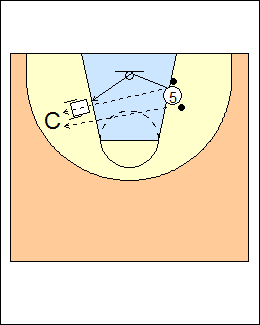 Get another pass in the short corner for a move or shot. 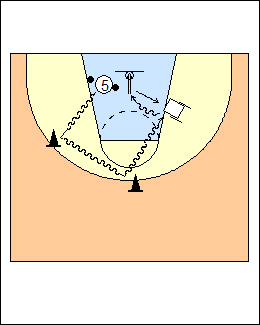 Progression - pop to the middle of the lane (e.g. on a baseline drive) for a pass and shot, then another pass and finish.